I can’t remember exactly how many processes you have at startup, I think somewhere between 20 and 25, correct me if I’m wrong. Anyway, this is what I’m at right now, after a few weeks of heavy usage. My pagefile usage might seem a bit high, but that’s because I’ve got a 64MB Ramdisk running as a temp drive for my Firefox cache. After manually configuring the registry many times, I have finally broken down and usually use BlackViper’s custom "SAFE" XP Pro Config (use the XP Home one if you’re not using XP Pro). You can find the link to download that reg file here. 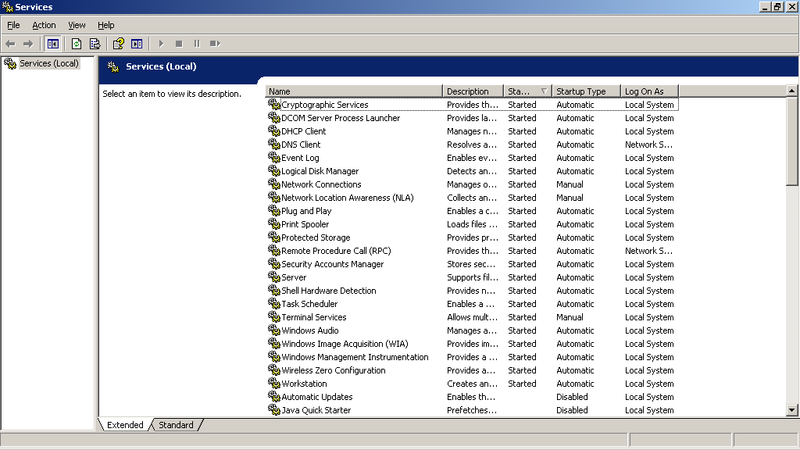 You can also use BlackViper’s Service Configuration Tool if you want to make your own (note that that’s the version for XP Pro, use the one appropriate for your version of XP). 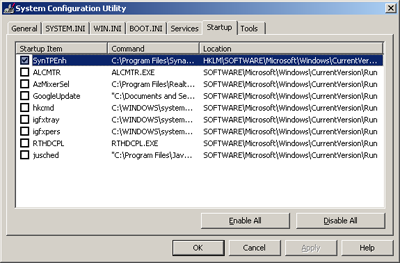 Simply unzip your SAFE configuration and double-click on the .reg file to add the tweaks into the registry automatically. Restart your computer after doing this. 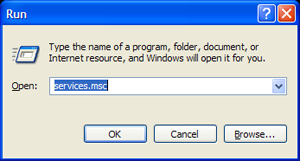 After restarting, go ahead and open up the Services Editor by pressing the Windows Key and R at the same to bring up a Run dialog. 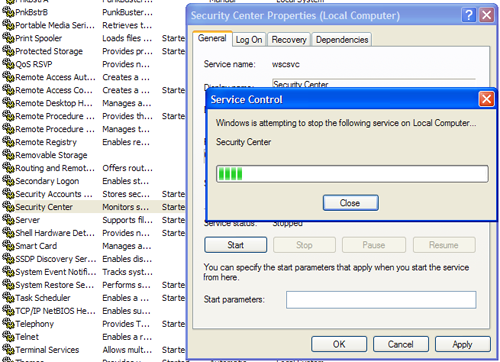 Type in "services.msc" and press Enter to bring up the Services Editor. I can’t quite remember what is still not disabled after a fresh run of the SAFE configuration, but I think you still need to disable the Security Center, among other things. 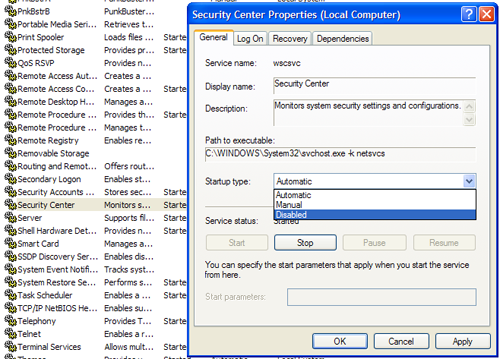 To do that, find "Security Center" in the right hand, double-click on it, change the "Startup type" from Automatic to Disabled. Also press the "Stop" button right below that to stop the process immediately. Then click OK. I can’t remember exactly what else needed to be disabled, but I manually ran through the Black Viper list, further disabling what I did not need. Here is a screenshot of my current services configuration. After weeding out the remaining services, open another Run Dialog, type in "msconfig", and press Enter. Click on the "Startup" tab. As you can see, I disabled everything from running at startup except for the Synaptics Touchpad Driver as I found it must be running to enable circular scrolling. If you don’t use circular scrolling (why would you not? ), feel free to disable it to. Now click OK and click on Restart to go ahead and restart your computer. 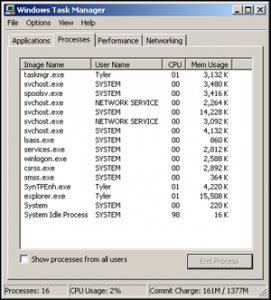 This should get you to around 16 processes running at a fresh startup and login, which is just what we want for the Aspire One’s limited resources. 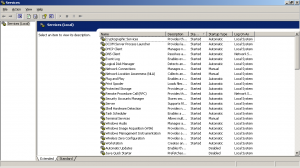 Previous PostHow to Create a Custom Windows XP for the Acer Aspire One Using nLite.Next PostUse Your iPhone 3G as a Modem – Using the USB Cable!